The following is a our tour of Cades Cove which will loosely follow the auto tour booklet available from the National Park Service. The numbers represent markers along the road way and sights to be found near them. One of the most popular destinations in the Smoky Mountains, Cades Cove is home to an amazing blend of natural, historical, and cultural features. 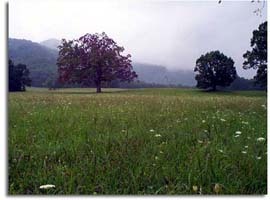 The area referred to as Cades Cove is a 5,000 acre valley hidden within the Great Smoky Mountains. Cades Cove loop road is closed to motorized traffic on Wednesday & Saturday mornings until 10:00 am to allow safer travel for bicycles and walkers. 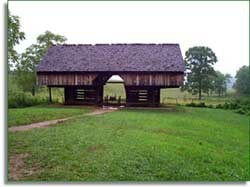 Our tour of Cades Cove will begin at the Orientation Shelter. This is a good place to park if you intend to ride your bike, walk or run the loop. Its also a good place to meet if you become separated from your party during your trip or if you want to split up. You can also pick up a tour guide (booklet) here if you would like. Caution: Children, bicyclers and pedestrians can be around any corner! This land was purchased by the state of Tennessee from the Cherokee Indians. Land speculators, who had purchased large tracts of land from the state, then sold smaller parcels to families to farm. The East end of the valley was the first to be settled. It is higher and drier than the West end, so if you are looking for a specific type flora or fauna keep that mind. 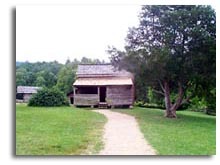 Cades Cove was once home to as many as 125 families who farmed the rich valley soil and lived off of the land. Today it contains an 11 mile, paved, one-way loop road that circles the valley floor. Along this loop road visitors will have the opportunity to see the historical and cultural remnants of a previous life in the valley as well as the natural beauty found in this mountainous area still today. 2) Sparks Lane - turning left here is your first chance to shorten the 11 mile distance of the loop. This gravel road has 2-way traffic. This road is one of the many great areas for bird watching. 3) John Oliver Place - The Oliver's first purchased land here in 1826 and this cabin remained in there name until the park was established. This two-story cabin was built in the 1850's, for John Oliver's sons. John Oliver's original cabin was also on this piece of property and stood about 50 yards behind this existing cabin near a small spring. was organized in 1827 and was originally in a log building until 1887. Names from most of the families who first settled in the cove can be found in The graveyard, Oliver, Gregory's, Shields and more. Noticing the dates infants deaths were not uncommon reminding us of some of the difficulties of living in those times. 5) Methodist Church This church was organized in the 1820's. It is 1 of 2 Methodist churches in the cove. The other is now only marked by a small cemetery. Like the Baptist church this Methodist church was originally a log building but was replaced in 1902 by the current framed building. 6) Hyatt Lane This is your last chance to shorten the distance of the 11 mile loop. Hyatt Lane is a 2-way gravel road. This road was originally used to cross the cove for easy access from the south side of the cove to Townsend (via Rich Mountain Rd). This road is a great area for viewing Whitetail Deer especially in the early morning and evening. 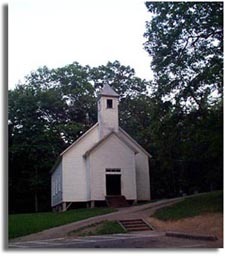 7) Missionary Baptist Church This church was formed in 1839 by ex-members of the Primitive Baptist Church. These members were dismissed because they favored Missionary work, an issue that divided Baptists everywhere. This building was built in 1894. 8) Cades Cove Rd. Also known as Rich Mountain Rd is one-way traffic within the park boundaries. The road leads from Cades Cove, just North of the Missionary Baptist Church, over the mountain to Townsend. This wagon road was built in 1830 and was used as the primary road for entering or leaving the cove for 100 years. 9) Cooper Road Trail was originally a trail to Maryville but was eventually turned into a wagon road. Now it is a 10 mile foot trail that ends near the foothills parkway. 10) Elijah Oliver Place Notice the many different buildings, barns, spring house, corn cribs, smoke house. 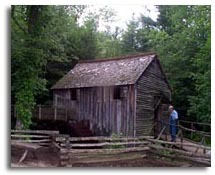 11) Cable Mill Area You can find a visitor center with gift shop, a working water powered mill, blacksmith shop and many other historic artifacts. 12) Henry Whitehead Place You will probably notice this cabin is much nicer than most of the others. Built in 1898 from logs sawn and squared at a near by mill. Most of the interior walls and ceilings were hand planed with thousands of strokes. A brick chimney, a rarity in the cove, was built from bricks molded and fired right on this property. 13) Cades Cove Nature Trail Park here and take a short (1/2 mile round trip), easy hike through the woods. 14) Hyatt Lane The South end of Hyatt lane (#6). Take this road if you would like go back to Cable Mill or if you would just like to extend your trip. 16) Tipton Place is a small cluster of buildings that includes a house, blacksmith shop, smokehouse, wood shed, cantilever barn, and corn crib. 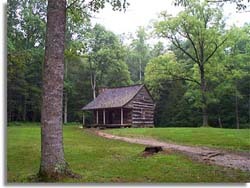 17) Carter Shields Cabin - This cabin was built around 1830-1840's. It was owned by George Washington "Carter" Shields (1844-1924). 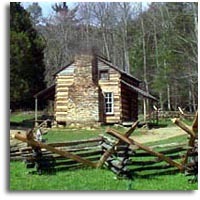 Carter bought this land and cabin from John Sparks in 1910. Mr. Shields lived in the cove until 1921. Stop Sign This is the end of Cades Cove Loop. Turning left takes you out of the Cades Cove area towards Townsend, Gatlinburg and Pigeon Forge. Turning right here takes you to Cades Cove campground, ranger station, store, restrooms, bicycle rental and more.